Steve Carell is truly a movie star to be treasured. His sincerity and understanding of what an audience based in reality wants is all the more reason to love everything about his character. No matter how big a name he becomes, we always feel a relatability to him letting us know that besides the fame, money, and comedic chops he is just like all of us. He makes us feel comfortable and that is something not too many movie stars can claim. With that everyman persona ready and set we are introduced to Cal, a man who has become set in life, relaxed in his setting and a father that exudes love and understanding with his children even if at the moment we are introduced to him we witness the breakdown of his 25-year marriage to his wife Emily (Julianne Moore). 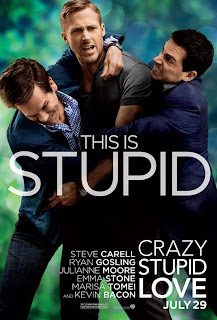 "Crazy, Stupid, Love." is one part comedy, one part drama and it balances those moments of both comical farce and tear-jerker realizations with great care. We never feel forced into a situation as so many romantic comedies seem to do these days and most importantly we fall for these characters. With multiple story lines all involving relationships and feelings at drastically different stages we get a full and satisfying picture of what a crazy and stupid emotion love can truly be. Directing pair Glenn Ficarra and John Requa who only have the indie comedy "I Love You, Philip Morris" under their belts still seem a bit shaky in capturing what is in their script in the most confident ways on film. The style of the camera work at times feels very amateur while at some points (especially in how they capture the bar where Cal meets Ryan Goslings character Jacob) it is very fluid and big-budget Hollywood-like. This is no doubt done with some intention of evoking the certain tone and even emotion of the scenes where the handheld technique is used but more than anything it felt a little jarring. This is really beside the point though as Ficarra and Requa have assembled a cast that you could watch for two hours on home video footage that was shot by a baby. Along with Carell and an enjoyable Moore who seems to be taking more cues from the experience of last years "The Kids Are All Right" and venturing more into comedic territory, we also have the ever curious Gosling making a surprising turn of his own into comedy. After "The Notebook" the guy took a turn into serious acting mode and so with this role Gosling is able to exude a charming yet slightly repulsive man whore who happens to possess the best wardrobe ever put to film. In retrospect it is really Goslings film. 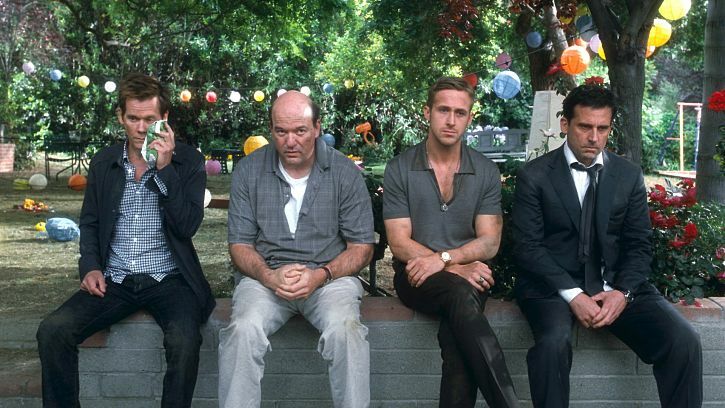 Whereas Carell is our main character Gosling is the one holding this thing together. His story arc, as predictable as it might be, is elevated by the man we watch him become by the finale of the film. It doesn't hurt that he has Emma Stone at his side either. Stone who seems to be able to do no wrong these days gives us another reason as to why we believe that. She is every bit as sweet, honest, charming, and funny as Goslings counterpart and she does so with what feels like too limited of screen time. Marisa Tomei and Kevin bacon give nice little touches to the supporting cast as the rebound lovers for both Cal and Emily. Tomei deserves special attention for making her school teacher a real piece of work though. The other storyline here concerning Cal's 13-year old son and his love crush on their babysitter is understandable and the babysitters crush on Cal isn't as creepy as that might sound but it does add some unnecessary complications to the plot line. Steve Carell are a bit roughed up after a back yard disturbance. As Robbie, Jonah Bobo gives all of our adult characters a little perspective but isn't made out to be the tween who is wise beyond his years, as most films tend to do. I found him to be a little much at times with his going-on's about love and all but hey, that's what the movie is about so I get it. The film does offer a few surprises that I honestly didn't see coming. I did sit and think about them long after the credits rolled just to see if it really made sense and it seems like it does though I am anxious to re-watch the film from a different perspective and see if it still flows as smoothly. For now though, I genuinely enjoyed every moment of this film. It is engaging and tender. It rises above any romantic comedy in recent memory and it boasts a talented cast that escalate the material that much further. 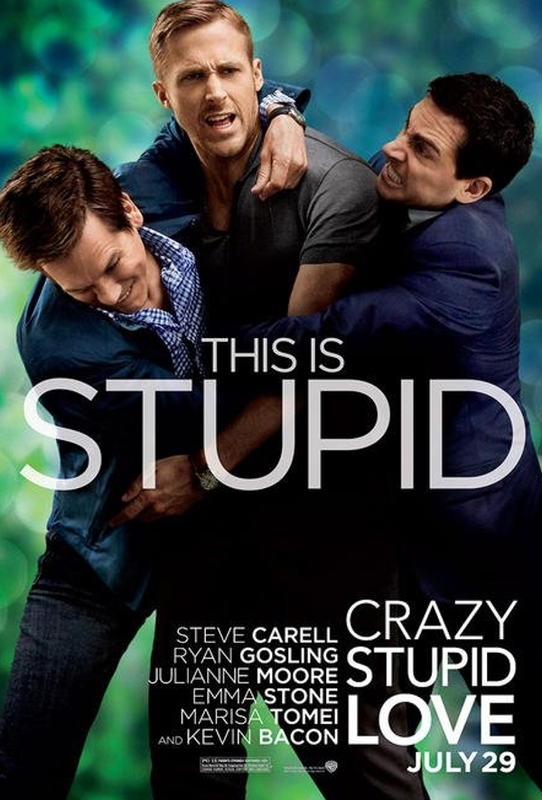 Though "Crazy, Stupid, Love." should have probably ended on the funnier and more profound note that takes place just before the movie packages things all too neatly at the end it would also be unwise to let the audience depart from the film without smiling. We could have gone without the big dramatic speech, but to see these characters we have been through so much with find a little calm in their life isn't crazy or stupid. It might be love, but for that moment it is simply, perfect.